To be successful in the ad business, it is essential that you continue to absorb new ideas. And what better place than AdFest? 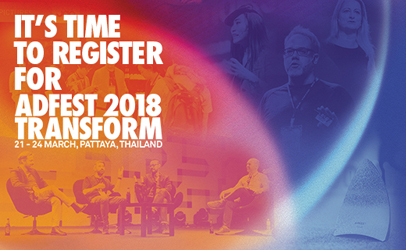 This year the theme is ‘Transform’, and you could be the one that is transformed by attending this festival. If you haven’t been yet, then this is a treat in store. You will not only gain valuable insights and learn a lot, you will mingle with creatives from all over the world. And it’s fun too. The poolside parties and beach resort setting add to the enjoyment. You can choose to attend only the Craft@AdFest on 21st to 22nd March or the Creative@AdFest from 23rd to 24th March. If you can spare the time take the third option and attend both. Whichever you choose, based on past experience, AdAsia feels this will be a transforming experience for you. Don’t miss AdFest 2018.